Overview: You and your fellow explorers have journeyed deep into a Mayan (or Aztec or something) temple, but now you find that it’s cursed! Activate the magic gems, beware the black masks, and get to the exit before the temple collapses. 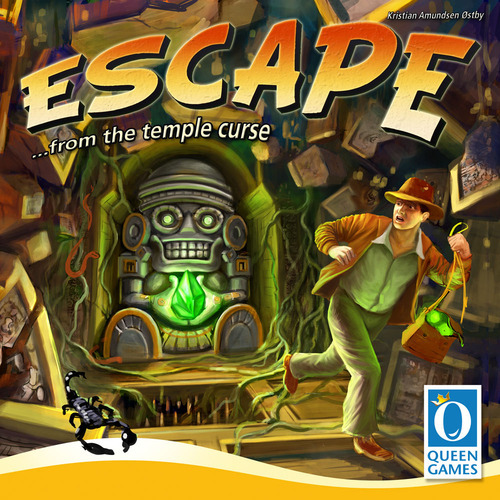 Escape: The Curse of the Temple is a real-time cooperative dice-rolling game that funded on Kickstarter early 2012 and is now available for purchase. Playing Time: 10 minutes … or less! Rating: Fran(tas)tic! Fast-paced, exciting, and quick. Who Will Like It? People who like rolling dice, fast-paced games, and cooperative games. And even if you’re not a fan of the alpha player problem in cooperative games, this one’s worth a shot — when the timer’s ticking, it’s hard for somebody to be the boss. The chamber tiles are all sturdy cardboard squares, about four inches on a side, with the gem depot being a slightly smaller rectangle. The graphics are nicely done to look like temple ruins, and the starting chamber and exit chamber are easily identified by their grey color. 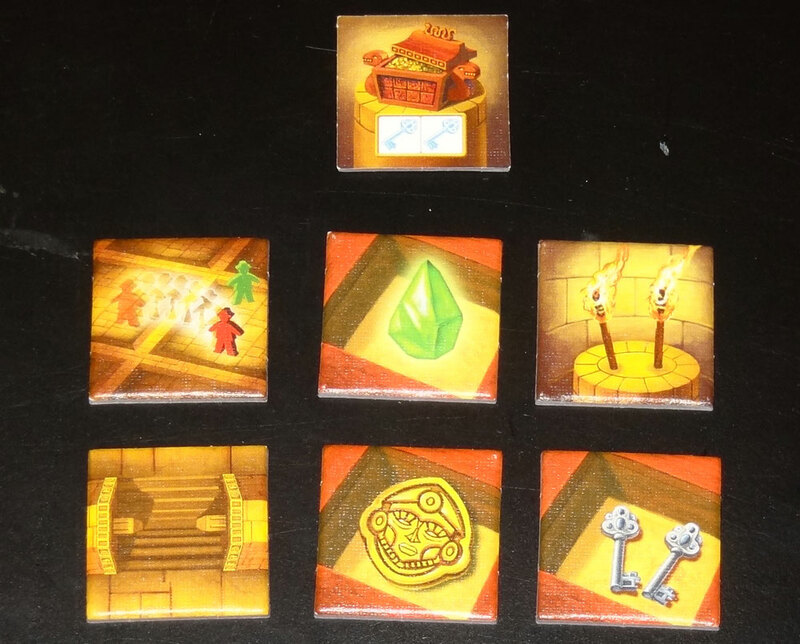 The figurines are little wooden meeple-like figures (with fedoras), and the “tokens” are simply cardboard ovals that match the color of the figurine. The dice are nice — standard size, rounded corners, with the symbols etched and painted so they won’t rub off. The gems are clear green plastic and are pretty nice, although they’re tiny enough that you’ll want to watch that you don’t knock them off the table. The soundtrack isn’t just for setting the mood — it’s a game timer, plus there are three tracks (German, English, and French) that explain the game. The soundtrack is great, with some spooky noises, but I found that the gong that sounds isn’t always loud enough that you can be sure to hear it while you’re rolling a bunch of dice. And it would be nice to have a longer track for an easier game. You can use the sand timer instead of the CD, but it’s harder to keep an eye on that while you’re racing around the temple. The goal of the game is to find the exit and get everyone out before the temple collapses — you’ve only got ten minutes. To get out, you’ll need to be able to roll as many keys are there are unactivated gems — the ones in the depot — so it’s important to activate gems as you search for the exit. The starting chamber is placed face up in the center of the table, and two randomly-drawn chamber tiles are placed next to it (with the grey steps facing the doorways). Take four room tiles, shuffle the exit tile into them, and place them at the bottom of the pile. Each player gets five dice (seven if you’re playing solo), a meeple, and a token. The colored token is just placed in front of you — it helps other players identify quickly which color you are. The meeples go into the starting chamber. Place the gem depot to the side with gems on it; the number of gems depends on the number of players. Also, place two gems next to the depot. Start the CD (or the sand timer) and you’re ready to escape! There are no turns — you just keep rolling dice as quickly as you can and taking actions, but watch your other players to see if they need help. If anyone gets trapped in the temple, everyone loses! Green adventurer (2 of these): You need this to move and to discover new chambers. Blue key and red torch: Some chambers require these to enter, and you’ll need these to activate magic gems. Black mask: This curses your die and prevents you from rolling it. Golden mask: This breaks the curse on up to two masks. As you roll dice, you can reroll any number of the dice (as long as they aren’t cursed). Any time you use a die for an action, however, you must reroll it. You can also help somebody with your golden masks as long as you’re in the same room — you can use your mask to break two curses for another player, but you can’t split the mask to unlock one of yours and one of theirs. Here are the different actions you can take with your dice: enter a chamber, discover a new chamber, activate magic gems, provoke a turn of fate, and escape. Discover a chamber: If you’re in a chamber that has at least one unblocked doorway that has no tiles on the other side, you may spend two green adventurers to draw a new tile and place it at that doorway. The grey step on the new tile should be placed facing your doorway. Note this does not move you into the new chamber. Activate magic gems: Chambers that show gem icons on them can be used to activate magic gems. You must roll the required number of keys or torches (among all the players present in the room). Then you can pull the activated gem(s) from the depot and place them on the tile. There are some chambers that have 1, 2, and 3 gems (activated by 4, 7, and 10 icons, respectively); you can only activate one group of them in the chamber. For instance, if somebody has activated the 2 gems, then you can no longer activate the 1 or the 3 gems. Provoke a turn of fate: If there are just too many black masks on the table, you may place one of the extra gems (next to the depot) into the depot, and then everyone can re-roll all of their black masks. You can only do this twice per game by unanimous vote, and it makes escaping a little harder. Escape: If you make it to the exit chamber, you must roll as many keys as there are gems left in the depot plus one — by yourself. So if there are two gems left in the depot, you must roll three keys to escape. If you escape successfully, you may give one of your dice to another player still in the temple and they can start using it immediately. There’s one other wrinkle: the three countdowns on the soundtrack, indicated by the one, two, and three gongs. The first two times you hear the gong, you have about 30 seconds to get back to the starting chamber. Make it before the sound of the door slam, and you’re safe. Too slow? You lose a die for the rest of the game. The third time the gong sounds, you have to get out of the temple — when the track ends (with the sound of the temple collapsing) the game is over, win or lose. You can change up the game by adding one or both of modules: Curses and Treasures. You remove the 13 basic chamber tiles (leaving the start, exit, and the four tiles that have the 1, 2, 3 gems) and put in the Curses and Treasures chamber tiles. Some chambers have a purple mask, some chambers have a gold treasure icon, and some have both. The Treasures module can make it a little easier by providing some bonuses, and the Curses module makes things harder. You may not enter or discover a chamber. Keep one hand on your head. You’re not allowed to speak. Place one die on this card — you cannot use it until you break the curse. If you roll a die off the table, it’s gone for the rest of the game. Each golden mask only unlocks one black mask. Teleport: move to any chamber containing another adventurer. Extra gem: take a gem from the depot and place it on this tile. Double torch: this counts as two torch icons. Secret passage: place this tile between two adjacent chambers — it serves as a permanent doorway for the rest of the game. Healing mask: everyone can re-roll all of their black masks. Double key: this counts as two key icons. When Escape showed up on Kickstarter earlier this year, I was pretty excited about it. 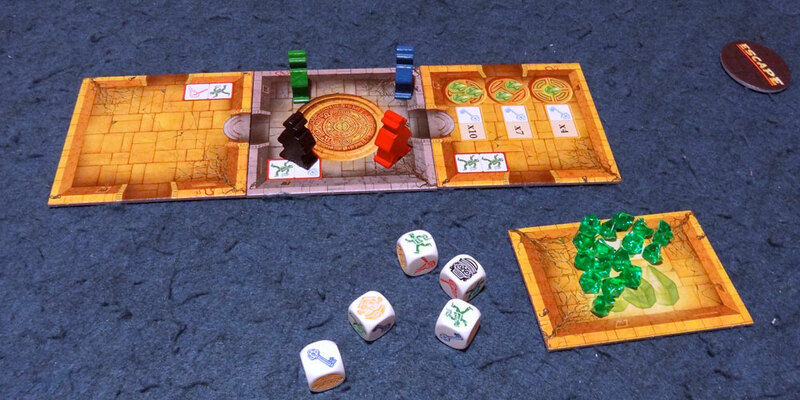 I’m a big fan of Wok Star , another time-based cooperative game (which, alas, has not had a wider printing yet). This looked like it could provide a similar experience, plus you got to roll a lot of dice. I backed it at the $50 level, which not only got me the base game but also the Illusions expansion which includes more curses and treasures, the 6th player expansion, plus new chamber tiles with other effects. Unfortunately, if you didn’t get in on the Kickstarter, you’ll have to wait for Illusions — currently it’s listed on the German Amazon.de but hasn’t shown up in US stores yet. Still, even without the expansion, Escape is a whole lot of fun, and well worth the price. It’s especially chaotic (and wonderful) with a full team of people. It doesn’t take long to explain the game, and then it plays in strictly ten minutes or less, although I’ve rarely played just a single game before putting it away. The frantic dice-rolling and running around the temple fits the theme perfectly, and you often have to make split-second decisions about whether to go back and help a teammate or press on to activate gems. There are some other real-time cooperative games on the market — Space Alert and Space Cadets come to mind, as well as the Kickstarter-funded Damage Report (which isn’t out yet). Those are all sci-fi themed instead of adventure-themed, but the bigger gameplay difference is the way timing works in those games. In Space Alert you have an amount of time to pre-program your moves, but then after time’s up you see how everything played out. Space Cadets has timed mini-games, but then there are bits of down-time for certain actions. With Damage Report , the whole game is playing with the timer running, but you’re only taking one action every 15 seconds (or more), which means that although there is tension, it’s in the waiting and not in the constant rolling of dice. Each of those games scratches a different sort of itch — Escape is great for a quick dicefest. I played this with my kids — ages 6 and 9 — and they both loved it, too. However, they were a little freaked out by the spooky soundtrack and preferred to play without a time restriction. Granted, if you don’t have a time limit then you’re almost guaranteed to win the game. The only way to lose is if everyone rolls all black masks and you’ve used up both of your “turn of fate” actions. Even so, it’s a great way for younger kids to learn the game. I do wish that there were a longer track to make the game slightly easier, but I may just make one myself. (The suggestion is to use fewer gems for an easier game.) There’s a “designer’s cut” version of the soundtrack on BoardGameGeek that makes the gong and countdown a little more obvious, and Queen Games also has a soundtrack that is silent except for the gongs and tense countdown music. I’ve played over a dozen times with many different players, and I haven’t tired of it yet, and that’s mostly playing the basic version. I’ve put in the Curses and Treasures modules, but I haven’t even broken into the Illusions expansion other than to add the 6th player. Generally Escape isn’t the only game I’ll want to play on a game night, since I do like having something meatier for the main course, but it makes a great appetizer or dessert (or both). One last note: Escape is definitely going on my best games of 2012 list — I especially made time to write this review so it’d be eligible! — but it’s not for everyone. Some people just don’t like the stress of making decisions under pressure. And some people just don’t like rolling dice. (Okay, I’m not sure I know many of those, but I imagine it’s true.) If you can’t handle lots of noisy die-rolling and shouting for help and tile-flipping, then you may want to pass on this particular ancient temple. For the rest of you, though, it’s time to Escape ! 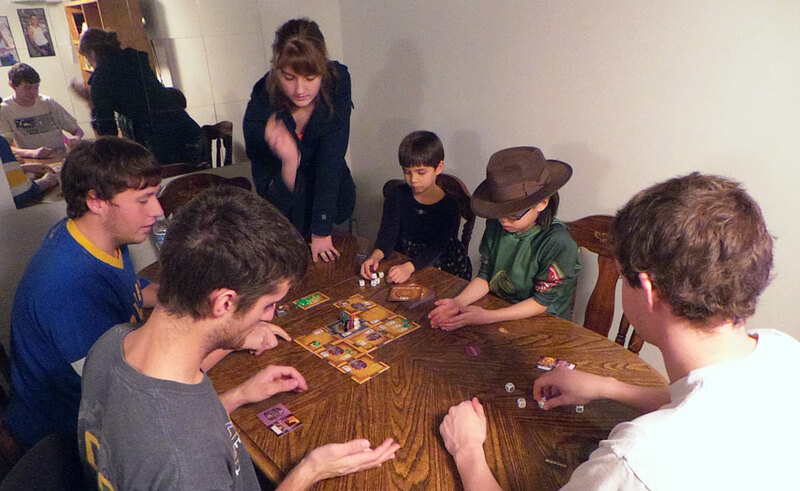 Wired: Frantic, fast-paced, cooperative game that ends in ten minutes. High quality components, including CD soundtrack. Tired: Would be nice to have a longer soundtrack for a slightly less stressful mode.